Looking To Find a Local Emergency Plumber in Balham Sw12? Aquaheat is based in South West London and is the ideal place if you are looking to find a local Plumber in Balham for plumbing services such as Boiler Installations, Boiler Repairs, Boiler Servicing, System Conversions, Solar Panels, Bathrooms, Landlord Gas Safety Certificates and much more. If you live in the Balham area and are looking for a Gas Safe registered Plumber Balham then Aquaheat can help. We have the experience and knowledge to help you with your plumbing and heating problems and are local to the Balham SW12 area. Welcome to AQuaheat. My name is Steve and I am the owner of Aquaheat. I personally have over 25yrs experience in heating, plumbing installations. I understand how difficult it can be to know what comapny to choose online when you do not know what the background is. I can oly say for me that I have seen most issues with domestic boilers-and plumbing systems and you can’t beat experience. Ever after 25 yrs i’m still learning. If you need a plumber Balham today or next week then please give me a try! In this plumbing video, Our Gas Safe Plumber Balham engineer is on another boiler installation in Balham (SW12) South West London. He has just installed a brand new Worcester 30CDI conventional condensing boiler in the Balham sw12 area and is talking through the installation and how the boiler works. Conventional condensing boilers are similar to the old style of regular boilers because they are connected to a conventional system, which includes, a boiler, cylinder and tanks in the loft. 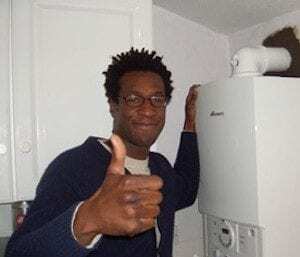 All modern boilers have to be condensing, (so the 30CDI in the name of the boiler can be confusing because it sounds like the 30CDI combi) but it’s a CDI regular condensing boiler, not a combination condensing boiler (If you would like more information on the different types of boiler, please drop us an email or give us a ring, so that we can go through the options that are best suited for you). To complete this boiler installation in Balham, the plumber has removed the old boiler (which was a Potterton Profile boiler), which was very tight in the cupboard and has replaced it with the new boiler, which has been fitted into the cupboard nicely. The flue extension has been run from the boiler out onto the roof outside, which terminates the plume up and away from the window. There is a boiler stat on the front of the boiler and the plumber Balham has rewired this into the customers current heating system, which has been fitted with a pump overrun. The plumber Balham must fit a pump overrun on this particular boiler in order to expel any excess heat. This makes the heating system more efficient and also reduces the gas consumption of the boiler making it more efficient and cost-effective. It is also a requirement for the boiler and needs to be fitted in order to get the warranty. It could also damage the heat exchanger if a pump overrun is not fitted. As with all of our boiler installations, the plumber has flushed the system through and added a chemical inhibitor (this is logged for reference on the front of the boiler) to stop any sludge from building up in the heating system. Adding inhibitor also helps to protect the new boiler. The boiler on this installation in Balham was then tested by the plumber to check that everything working and heating up nicely. All Aquaheat plumbers and heating engineers are Gas Safe registered. and have many years experience in this field. Most boiler installations will be completed within a day and we will even dispose of your old boiler for you. All “Aquaheat” plumbers are approved Worcester Bosch installers and this means that you will also get a warranty on Worcester Bosch boilers, which covers parts and labour if there are any issues with the boiler. We are also approved installers for Valliant and Vessimann boilers. “Aquaheat” runs a 24-hour emergency service for faulty boilers and burst pipes. This service also covers over the weekend. We can also accommodate customers who have to work late by booking in a late evening boiler service. (This is subject to a slightly higher rate which covers the out-of-hours service. If you would like more information on our plumbing and heating services in the Balham or south west London areas, please contact us via email, telephone or fill in the contact form on the page and we’ll be in touch as soon as possible. How to Fill a Worcester Bosch boiler using an external filling hose. For a quick quote or some friendly advice, fill out the form below and we’ll be in touch shortly.